Summertime rains are a very curious and changeable event. The sky can be threatening and dark or sunny and bright when the rain starts to fall. One can try a hand at predicting where and when the showers may appear by looking up and gauging what the sky is portending. 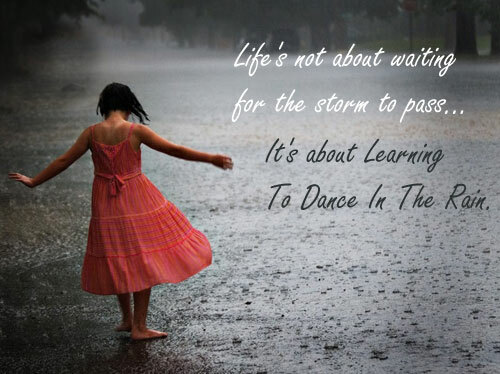 Our life storms and changes can be much like these summer rains, sun showers, thunder storms or sprinkles. Change comes in many forms. It can be turbulent, mild, predictable or sudden. Transitions can be big, small or somewhere in-between. Our challenge and choice is always how we decide to adapt to whatever comes our way. We can try to adapt with healthy and compassionate coping skills and understanding or we can become stuck in feelings of hopelessness and despair. Is it hard to imagine adapting to a death, divorce, illness or job loss calmly and compassionately? Getting to that place takes time, for we must travel through our private storms of strong emotions, feelings of anger, grief, loss and letting go. Can you think of a time in the midst of your own transition when you found yourself in the eye of the storm feeling overwhelmed and spinning out of control? The turbulence and fear of changing years of the patterns of being married, thinking as a couple and counting on your partner can bring up lots of doubts, insecurities and anxieties. The process of divorce can feel like the storm is ripping up the trees by it’s roots. The death of a loved one also uproots us. This may feel like a storm of hopelessness. Imagining life without the person that you have lost seems unimaginable. Within the pain of your grief, it doesn’t seem possible that life without your loved one will be able to hold smiles, laughter and living. Illness or job loss may have us feeling deluged in the power of rains beyond our control. Our identity is shifted from healthy to sick, employed to unemployed, leaving us to question who we are now. Thinking beyond to who we might become doesn’t seem possible. 1. Having something to hang onto in the midst of these storms will be a key source of support. Friends, family and professionals can each be a steadying hand and encouraging presence in the heaviest of thunder, lightening and rain. 2. 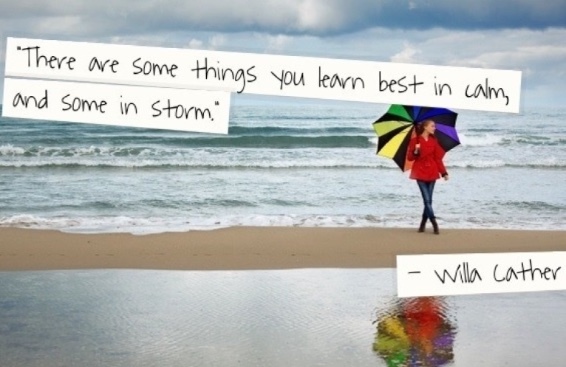 What we learn in the storm will guide us to what we learn when the skies have cleared and the storm has abated a bit. In the storms of death, divorce, illness or job loss, tending to what we need in the immediate is key. We need to allow our feelings and gather support around us to be where we are, before we are ready to move forward. Tending to the priorities of our needs in this period is all that we will see. That is the work of grieving our losses. 3. Over time, the process of letting go and taking those first baby steps beyond the storm is our introduction to what we will learn in the calm. Perhaps it will be being able to see a rainbow, the possibilities of hope, faith and future. 4. Journeys through life storms have the potential to lead us forward to places we may never have imagined. This is the place of being able to discover not only our skills of resilience, but also the places where we are able to let in calm and self-compassion. Our summer so far has had it’s fair share of sunny days and stormy days. We’ve have all sorts of variations of rains, clouds, sunshine and rainbows. How we navigate these changes are clues to the resources we need to turn to in times of our life storms and transitions. Give it some thought. The next time you grab that umbrella in the expectation of rain, think about what inner resources you may need to grab in case of life changes.